Due to inclement weather, the stargazing portion of the Davidson College Star Party will be cancelled for Friday, April 12th. However, the activity session and public lecture are indoors and will go on as scheduled. Please join us for some rainy-evening astronomy fun! 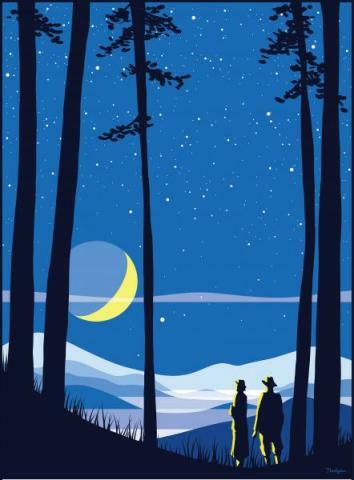 The Davidson College Physics Department and Society of Physics Students invite you to a Star Party to be held on the campus of Davidson College the evening of Friday, April 12, 2019 from 6:30 – 10:30 pm. As always, all of our stargazing events are free and open to the public! Come explore the wonders of astronomy and the night sky with your family and friends by joining us for the three events described below. Please stay for all three, or feel free to come for just one or two. As a host for the 2019 NC Science Festival's annual Statewide Star Party, our theme for all events is "The Moon and Beyond!" Please note that the stargazing portion of the event is weather permitting. In case of questionable weather conditions, check for weather updates at www.kristenlthompson.com/outreach/events or on the Davidson College Physics Department Facebook page. All other events are not weather dependent and will proceed as planned.